The best gas hobs can still take on induction hobs, despite the latter being all the rage right now, and powered by science and magic. In fact, gas is still the most popular way to heat stuff up, although probably not if we're talking only hobs sold in the last five years. Gas hobs are relatively cheap to buy and run, and can be used for all the cooking techniques people know and love. It's no wonder they've been cooking up a storm since the mid 1800s! 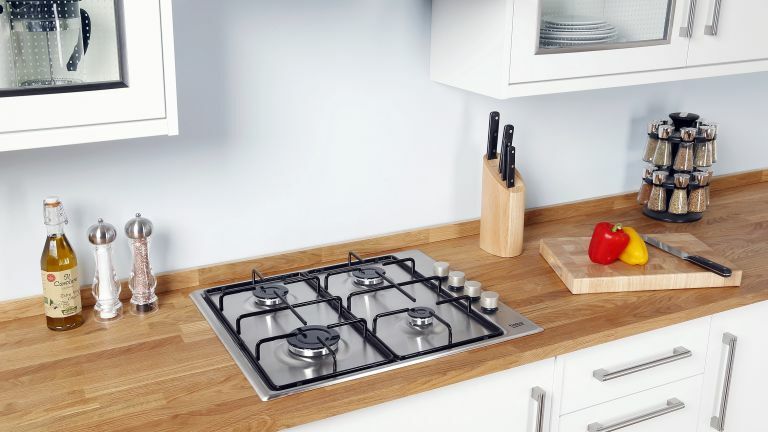 What is the best gas hob? In reality of course, all these hobs will whip up meals fantastically well. Most of them are a faff to clean, mind, but I can't do much about that. We took our own experience of gas cooking, and then researched the opinions of owners and professional reviewers to bring you this six-strong tranche of built-in gas champs. Our top three spots go to the handsome all-black Neff T26CS49S0, the versatile AEG HG956440SM – which comes with six burners for just £5 more – and the elegant black-clad, five-burner Bosch Serie 6 PPS9A6B90. Although it’s not as energy efficient as induction, top chefs still swear by gas because the heat a gas burner emits is instantaneous and easily adjusted. It also allows them to shuffle the pan when sautéeing or stir frying (induction hobs stop heating the moment the pan loses contact with the magnetic plate). When it comes to sourcing a model, first consider how many burners you require. Most of us get by very easily with the standard four-burner configuration. These units invariable measure around 60cm in width and go well with built-in ovens of the same dimensions. But if you’re an avid cook or have a large family of mouths to feed, you might want to up the ante and opt for a five, or even six, burner model instead. Remember that all these hobs need to be installed by a carpenter and a qualified gas technician. This shouldn’t be an issue if you already have an existing built-in hob of the same dimensions but it could be quite costly to install if you’re moving over from, say, an all-in-one cooker or range system. In this instance the carpenter will need to route a hole through your worktop to site the hob and you’ll obviously require a gas outlet near the installation area. Given that a gas burner is essentially a circular valve that opens and closes with the aid of a knob, there’s not a massive difference between models; they all perform the simple task of igniting on command, burning at full blast or performing a gentle simmer. However, some burners have a higher heat output than others and are therefore quicker at bringing water to the boil. Ideally, choose a model that has a more substantial kilowatt specification. Since the gas burner system is so simple and devoid of any moving or electronic parts, save for the flame igniter, chances are it’ll last a lifetime and very rarely break down. Even if one burner goes awry there are still three or more at your disposal. If that happens with an induction or ceramic hob, chances are the whole unit is dead. So, plenty of reasons, then, to either stick with the gas system you already have and treat yourself to a newer, better model or jump ship from induction or ceramic and embrace the arguably more practical joys of cookin’ with gas. As British Gas so rightly said throughout the 1980s in its terrible adverts, "cook-cook-cook-cookability" is indeed, "the beauty of gas". Hello Fresh review: how do we rate the dinner-in-a-box service? This stunning Neff gas hob draws you in with its starkly intense blackness and air of industrial ruggedness. That's thanks to cast-iron pan supports and a swathe of shiny black tempered glass. Even the stylish knobs match and who doesn’t like a matching hob knob? Speaking of knobs, these ones come with clearly defined numbers that can be adjusted one step at a time for both consistency and accuracy. They’re automatic, too: just turn the dial and the relevant burner instantly ignites. In terms of cooking space, you get one large 3kW high-speed burner on the right rear, two standard 1.75kW burners on the left rear and left front, plus a small 1kW simmer or economy burner on the front right. Plenty of options, in other words, for most cooking eventualities. Gas hobs are usually difficult to clean but this one’s easier than most: simply lift off all four cast iron pan holders and wipe the glass clean. It must be said, however, that because the glass is completely flat, some larger spills could feasibly drip over the sides and onto the counter top and floor. It therefore goes without saying that this is one hob that is best not left unattended when boiling vegetables and pasta. Given Neff’s excellent performance record in the cookware arena – its ovens and hobs are de rigeur with developers of high-end properties – you can safely expect this smart looker to provide many years of reliable frying, boiling, simmering and sautéing, all at a very decent price. Granted, this particular AEG isn’t as modish as the black-clad Bosch, Neff or Smeg, but it’s cheaper and just as powerful at getting the job done pronto like. If you have a large family and enough space to accommodate a six-burner model, consider installing this keenly-priced option from Allgemeine Elektricitäts-Gesellschaft, or AEG as the Bavarian behemoth quite understandably prefers to be known. The AEG features a large and powerful triple-crown 4kW wok burner, a 3kW rapid burner for flash frying, a pair of 2kW boiling zones and two small 1kW options for simmering sauces, boiling milk, etc – enough meal estate, in other words, to start a brasserie. Users rate this hob’s simplicity and versatility, especially when it comes to producing larger feasts. Key features include an LED control panel that tells you which burners are lit – handy if a burner is obscured by a pot or pan – and sturdy cast-iron pan supports designed to handle any size of cookware, including large, oblong casseroles. Given the flat rimless design of the stainless-steel cooking surface, we’d advise keeping major spillages at bay lest they emigrate towards the control panel and the worktop. If you have over 90cm of space on your worktop then this excellent model will suffice very nicely indeed. It comes with an excellent range of burners for every conceivable sitch. For under 700 quid you get two 1.75kW burners for everyday use, a 1kW one for simmering or gently boiling milk and a 3kW high-speed burner for frying stuff. As if that weren’t enough, over to the left is a massive 4kW double-flamed burner for rapid frying, sautéing and great deal of wondrous wokery. This attractive, five-burner hob looks rather similar to the Neff above, and little wonder: both brands are part of the same kitchen mega-conglomerate that also owns Siemens and Gaggenau. As a result, the Bosch has the same, wonderfully tactile 'FlameSelect' nine-position control knobs as the Neff. The large slab of black tempered glass beneath adds extra pizzazz to an already extremely well endowed hob, which not only looks the part but performs well too. This new entry from the Italian house of Smeg is easily the most powerful model here, although it is also a smidge pricier. Where the majority of wok or high-speed burners (the most powerful ring on any hob) kick out around 3kW of the scorching stuff, this beauty’s top-specced burner is more like a commercial kitchen, at 4.20kW. This means it’ll flash fry a steak, boil water or whip up a stir fry in record time. The remaining four rings are two 1.70kW standard burners, a 2.60kW high-speed one and two smaller 1.10kW burners for simmering duties. At 75mm, the Dolce Stil Novo’s surface is a bit cramped but it comes swathed in black Eclipse glass with stainless steel trim that gives it a high-quality premium look. However, the jury’s out on how easy it is to clean up after a major spill. Presumably you get your staff to do it. The five typically Smeggish control knobs are situated quite close to the front burners, so it’s best to avoid using a frying pan on them or the transferred heat from the pan could make them hotter than Hades itself, to the disadvantage of your digits. Lovers of symmetry may blanche, but the best thing about this John Lewis model is that it features an offset wok burner. This is an especially useful feature since it allows more space for a large wok or frying pan while still using the remaining burners. However, because the high-speed burner is just 2.2kW – others are usually around the 3kW mark – it’s not the hottest in the pack so bear that in mind if you like your steaks done really quickly. The other three burners are 1.65kW apiece, which is fine. This hob is a bit easier to clean than others because the stainless steel top is pretty flat. Also, there’s a lip around the edges to trap any large wayward spills. Rather interestingly, the two cast iron pan holders don’t have gaps over the burners and this is arguably a good thing since pots and pans are more likely to sit flush on top without any wobbling. Pan holders with cut outs over the flame area can sometimes deform a little during transit or if dropped. For its price, this hob is well worth a gander, even it doesn’t sport the hottest high-speed burner on test. Just be patient, guy. This model isn’t going to win any design awards and the build quality is, well, cheap, but it does what it’s supposed to do, with hardly any impact on the wallet. In fact, it could well be the cheapest hob in the land. If you’re on an extremely tight budget (with the emphasis on tight), consider this cheap but cheery four-burner option, which comes with a fairly powerful 2.9kW front burner, two very decent 2kW heating zones and a small 1kW burner for simmering and other delicate duties. Unlike most gas models, this one’s control knobs are on the right hand side, which is more aesthetically pleasing. However, this could present a singeing scenario if the front right burner’s on while you reach over the flame or hot pan it to adjust the back one. Ouch. The vast majority of users seem happy with their purchase though there are reports of the flame taking longer than average to ignite. On the plus side, it’s pretty easy to clean and, of course, it comes with a flame failure device like all modern gas hobs. It’s available in edgy black or hygienic white.